4Easysoft iPad Rip works as the outstanding iPad Ripper software to rip iPad video to Computer and it can copy iPad audio to PC, iPad photo. So it is really convenience for you to backup iPad files to Computer to avoid your iPod files losing or something else. Furthermore, 4Easysoft iPad Rip can display your iPad info automatically, like the iPad type, capacity, version, etc. With this iPad Rip, you are available to browse your iPad library quickly (Genre, Artist, Album). Plus, it has been updated to support iTunes 10.1 and iOS 4.2 now. Key features: 1.Rip iPad to Computer Easy to backup iPad videos to your Computer directly. 2.Copy music from iPad to PC Simple to copy iPad music to Computer. 3.Backup photos from iPad to PC Backup iPad photo to Computer. 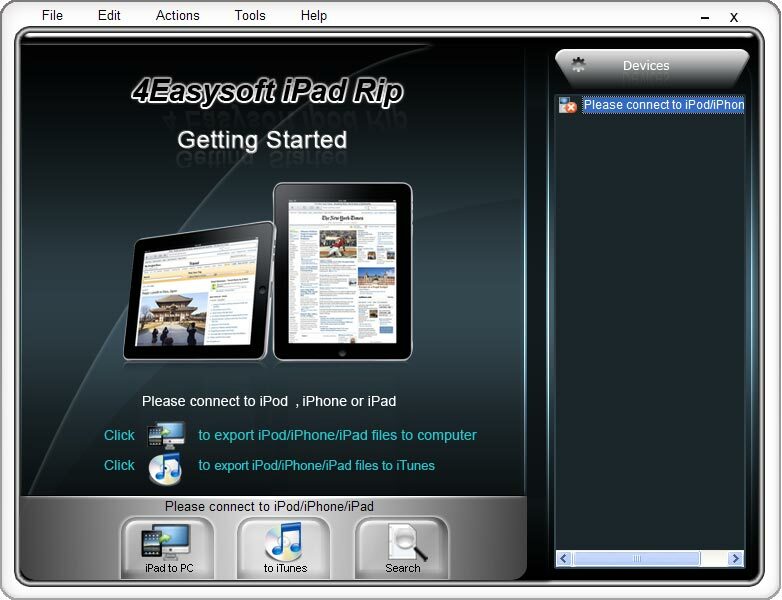 4.Discern iPad/iPod/iPhone info automatically Once you connect your iPad, 4Easysoft iPad Rip can recognize your iPad/iPod/iPhone specific information, such as iPad type, iPad capacity, iPad version, serial number, format, and the available space, used space in your iPad. 5.Quickly browse your iPad library Check "Search" to browse your iPad library, including the Genre, Artist, Album info. 6.Support most iPad/iPod/iPhone 4Easysoft iPad rip is compatible with iPad/iPod, iPod nano, iPod classic, iPod shuffle, iPod touch, iPhone, iPhone 3G, iPhone 4G and iOS 4.2. 7.Fast rip speed Provide the fastest rip speed to copy your iPad file to Computer. 8.Friendly user interface An intuitively designed user interface brings you more convenience and enjoyment. Cucusoft DVD to iPod Converter is the easiest-to-use DVD to iPod converter software for Apple iPod Movie and iPod Video. It can convert all kinds of DVD to iPod Movie / iPod Video format. Free 3GP 2 3G2 Pro is a totally free conversion program. It can help you to convert 3GP to 3G2 format with fast speed and high quality. With a user-friendly interface, it is easy to use for all its users. ImTOO Ripper Pack Gold includes DVD Ripper Standard, DVD Audio Ripper, Audio Encoder and CD Ripper, which are specially bundled to meet all your CD/DVD ripping and conversion needs: CD/DVD move/DVD music ripping and audio extraction/conversion. EZuse flv converter is not only able to convert video files in all formats into FLV but also convert FLV video files into all popular formats. For example, you can convert flv to ipod video format or convert flv to dvd format. Convert Media Pro is a powerful yet easy-to-use converter that can convert DRM and other audio video to any format. It supports audio to audio, video to video, and video to audio conversion. This site does not contain serial number, crack, keygen 4Easysoft iPad Rip serial number : serial number is the simplest type of crack. A serial number(cdkey,product key,etc) is register the program as you may already know. a crack or keygen may contain harmful software. If you cannot find the exact version you want, just give it a try. for more information read .nfo/.txt/.diz file include in zipped file.